This example shows how to design a feedback controller for a plant with uncertain parameters and uncertain model dynamics. The goals of the controller design are good steady-state tracking and disturbance-rejection properties. Design a controller for the plant G described in Robust Controller Design. This plant is a first-order system with an uncertain time constant. The plant also has some uncertain dynamic deviations from first-order behavior beyond about 9 rad/s. To study how the uncertainty in G affects the achievable closed-loop bandwidth, design two controllers, both achieving ξ = 0.707, but with different ωn values, 3 and 7.5. The nominal closed-loop bandwidth achieved by C2 is in a region where G has significant model uncertainty. It is therefore expected that the model variations cause significant degradations in the closed-loop performance with that controller. 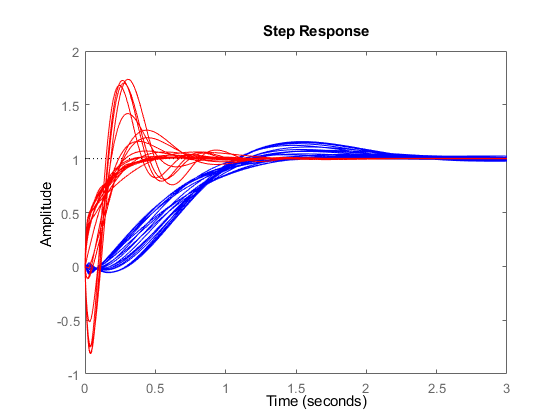 To examine the performance, form the closed-loop systems and plot the step responses of samples of the resulting systems. The step responses for T2 exhibit a faster rise time because C2 sets a higher closed-loop bandwidth. However, as expected, the model variations have a greater impact. You can use robstab to check the robustness of the stability of the closed-loop systems to model variations. System is robustly stable for the modeled uncertainty. -- It can tolerate up to 401% of the modeled uncertainty. -- There is a destabilizing perturbation amounting to 401% of the modeled uncertainty. -- This perturbation causes an instability at the frequency 3.74 rad/seconds. -- It can tolerate up to 125% of the modeled uncertainty. -- There is a destabilizing perturbation amounting to 125% of the modeled uncertainty. -- This perturbation causes an instability at the frequency 11.4 rad/seconds. The display gives the amount of uncertainty that the system can tolerate without going unstable. In both cases, the closed-loop systems can tolerate more than 100% of the modeled uncertainty range while remaining stable. stabmarg contains lower and upper bounds on the stability margin. A stability margin greater than 1 means the system is stable for all values of the modeled uncertainty. A stability margin less than 1 means there are allowable values of the uncertain elements that make the system unstable. While both systems are stable for all variations, their performance is affected to different degrees. To determine how the uncertainty affects closed-loop performance, you can use wcgain to compute the worst-case effect of the uncertainty on the peak magnitude of the closed-loop sensitivity function, S = 1/(1+GC). This peak gain of this function is typically correlated with the amount of overshoot in a step response; peak gain greater than one indicates overshoot. Form the closed-loop sensitivity functions and call wcgain. 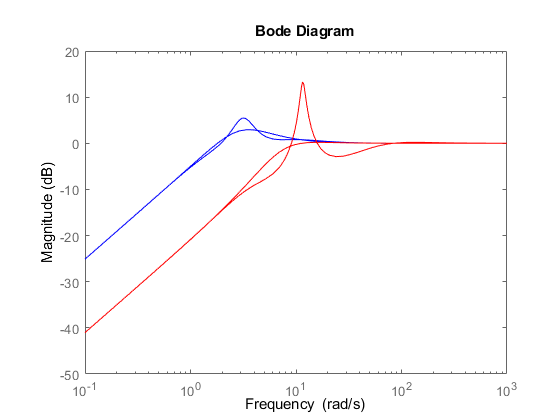 maxgain gives lower and upper bounds on the worst-case peak gain of the sensitivity transfer function, as well as the specific frequency where the maximum gain occurs. Examine the bounds on the worst-case gain for both systems. wcu contains the particular values of the uncertain elements that achieve this worst-case behavior. Use usubs to substitute these worst-case values for uncertain elements, and compare the nominal and worst-case behavior. While C2 achieves better nominal sensitivity than C1, the nominal closed-loop bandwidth extends too far into the frequency range where the process uncertainty is very large. Hence the worst-case performance of C2 is inferior to C1 for this particular uncertain model.